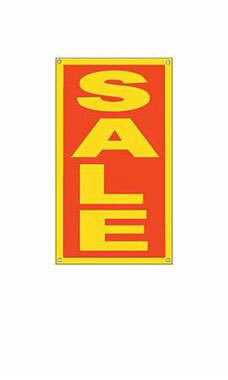 Draw more attention to your store and attract more customers with this large Sale Window Sign! This large sign comes with grommets in all four corners, which makes for hassle free hanging! Also outfitted with suction cups (included), this sign can be easily displayed in a window or any suction cup friendly surface. Measuring 44"H x 22"W, these signs are large and come with double sided Red print on durable yellow vinyl. This makes the sign visibility double!